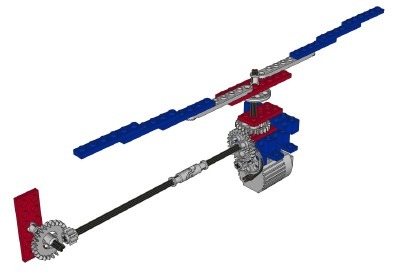 The small set 8050 was released in 1982 as the second Universal Building Set, and the first Technic set to ever include a motor. (Note that this does not include the earlier supplemental sets, some of which had motors.) It includes full instructions for 5 models as well as photographs of several other possibilities. 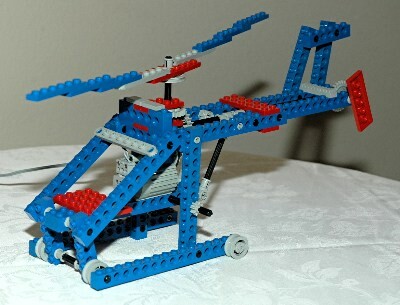 There a number of parts left over when any of the models are built, but the Helicopter and Buggy models uses the largest proportion of the parts. 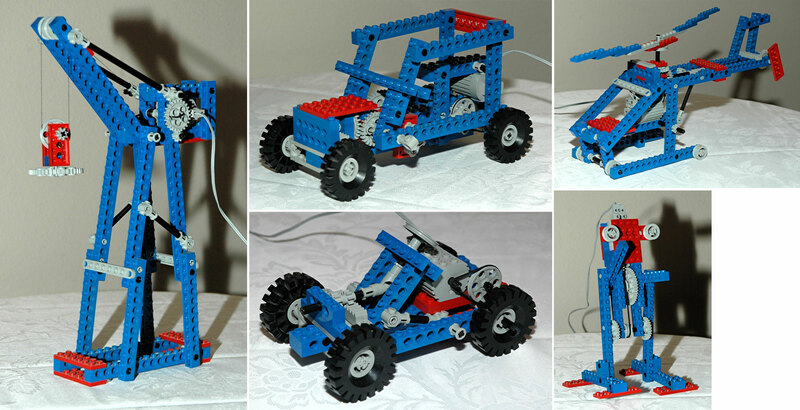 This is the first set to include a motor, which is 4.5V and runs on 3 C-cell batteries (more about the motor on the 1982 page). The motor is used in each of the models to drive a variety of functions. In each case except the helicopter, the motor is coupled to the model via a belt (rubber band) to prevent stalling the motor. The motor is underpowered for some of the applications and the belt either tends to slip or to stall the motor anyway. One of the reasons for this is that the driven axle is often also a structural pin (reacting shear load between two beams), which tends to make it bind and generate a lot of friction. Unlike set 8030, the models in this universal set cover a wide variety of subjects and complexity levels. In the first car, the motor simply drives the rear wheels and steering is manual. 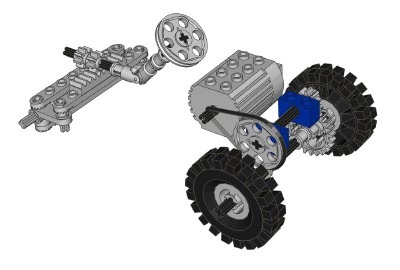 In the robot, the motor drives a crank which makes the robot walk. In the stationary crane, the motor simply turns a cable drum to lift a sheave. In the helicopter, the motor turns both main and tail rotors. The mechanism in the final buggy is pretty cool. Besides driving the rear wheels, the motor causes the front wheel steering to oscillate from left to right. All of the models use mostly pinned beam construction using both original pins and the new friction pins. Very few plates and no traditional bricks are included. I find the 5th model the most interesting, and it is the model I chose to keep assembled for my display of this set. This little car has manual steering and a motor driven rear axle. 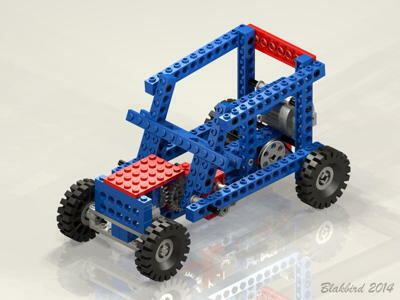 The motor is mounted on the driver's seat and drives a pulley via a belt which results in considerable gear reduction. The pulley drives through a set of 8 and 24 tooth spur gears for yet another set of gear reduction. The 24 tooth gear is on the rear axle. The rear axle helps hold the frame together and consequently carries a bit of shear load which tends to make the axle bind. Click for an animation of the car in motion. LEGO® gets big points from me for doing something other than a vehicle, but this little robot isn't exactly Asimo. It "walks" in a manner of speaking, but more realistically looks like it is having a seizure. 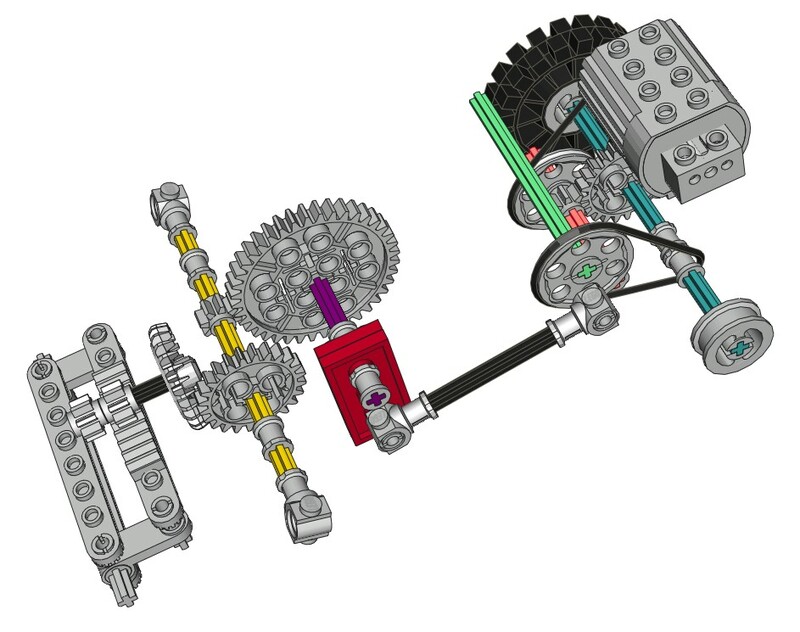 A motor mounted in the head of the robot has an 8 tooth pinion on the output shaft which drives a 24 tooth crown gear. The next stage is a set of 8 and 40 tooth spur gears which then drive a belt down to the robot's "waist" where a pair of 24 tooth gears act as cranks using the offset pin holes (see computer image). This final ratio of 15:1 sounds like a lot, but the legs still move way too fast to make this guy stable. One of the Technic gear reduction boxes would do wonders here, but would move the center of gravity even higher. The top end of the "legs" attaches to the second hole of the "arms" which makes them flail wildly while the robot attempts to "walk". As you look at the animation, you can see that the motion is highly nonlinear. First it moves very slowly, then it suddenly lurches as the balance shifts to the next side. This free-standing stationary crane looks nice but doesn't do much. A pair of trusses support a hoist system. 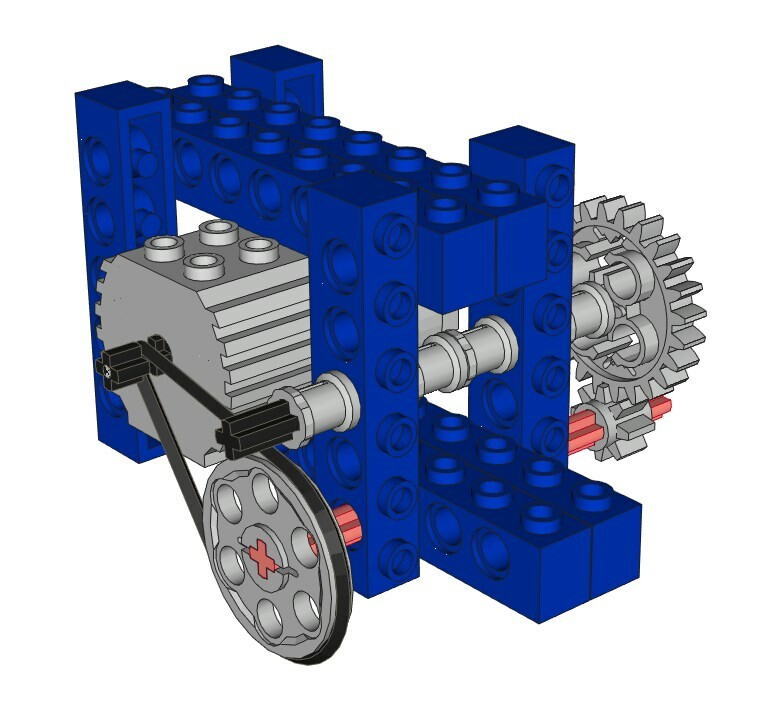 The motor drives a pulley via a belt, after which a set of 8 and 24 tooth gears turn a cable drum. The cable then proceeds up the fixed boom and down to a sheave. The sheave has its own pulley which further reduces the motion 2:1 compared to the cable. 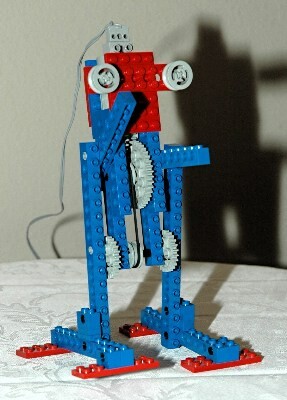 This system is hampered by the fact that the pulley axle (shown in red in the computer image) also supports the weight of the motor on the legs and therefore tends to bog down and not turn well. 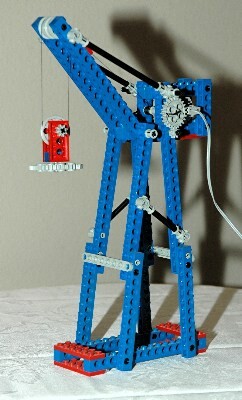 Click for an animation of the hoist in motion. The motor is mounted in the cockpit and drives a pulley via a belt. Next, a set of 8 and 24 gears lead to an axle heading back to the tail rotor. In parallel, a second 24 tooth spur gear is actually used as a bevel gear. This is the only place I have seen this done. Normally a crown gear would be used here, but the spur gear was needed for other models in this set so it was all that was available. The rotors rotate well although the angular velocity of the main rotor is far too fast with respect to the tail rotor (3:1). It should be the other way around. 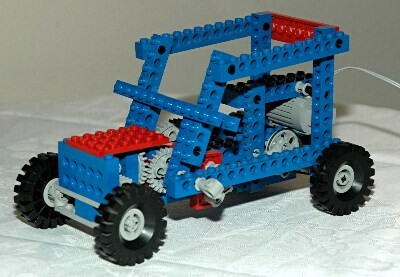 This buggy has a unique mechanism which couples the motorized rotation of the rear wheels to an oscillation of the front wheel steering. 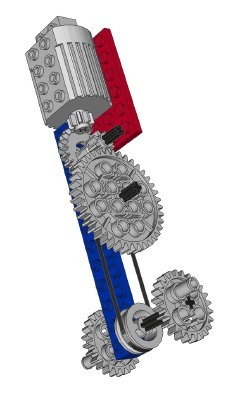 As can be seen in the color coded computer image, the motor belt drives a pulley (red axle) which, through a set of 8 and 24 tooth spur gears, drives the rear axle (blue). The rear axle drives another pulley (green axle) through a belt. This pulley acts as a crank and drives a pushrod. This pushrod turns a crank in the middle of the vehicle (purple axle) which controls the rack and pinion steering through a set of 40 and 8 tooth gears, followed by a pair of 24 tooth gears (yellow axle). 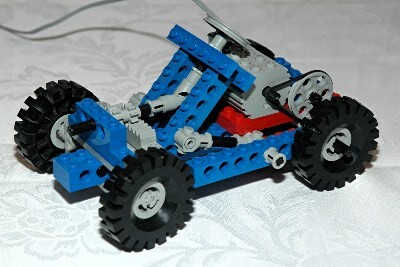 The steering mechanism itself uses control arms and toothed links. It is very important that the correct gear tooth be chosen when rigging this system or it will tend to steer more in one direction that the other. Because the steering is belt driven, it tends to slip much of the time. Even when working, the model doesn't turn very well because of the solid rear axle. Still, this is a great model to demonstrate how a variety of functions can work. Click for an animation of the mechanism in motion.